You know, some things change your like because they are just incredibly good, and some things change your life because of the chains of events. It was awesome, because... so many things were actually happening, the status quo could change radically in a few episodes, there were very scary villains and far less scary morally ambiguous characters, the heroine was so badass and the hero did build planes and it was adventure and steampunk and humor all rolled into one. So I didn't really stop anime, I just became picky. 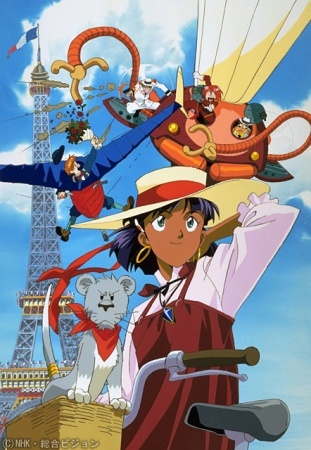 Fast forwards a few years, I'm a young adult, dating a man who, by the way, lent me all his tapings of Nadia (would we still have dated without this? I don't know). And that's the reason why I had the ideas to watch Evangelion "It's by the same studio. - Sure", and this way I fell into fandom (and slash fandom). I never got out since. Cette entrée a été crosspostée au https://flo-nelja.dreamwidth.org/610645.html. Commentez où vous voulez. I never watched Nadia, but you make me wish I had! It was more like, I will no longer have time, because I'll work more. Maintenant, avec le recul, je me dis que c'était "normal", mais à l'époque, je trouvais le scénario super-imprévisible !